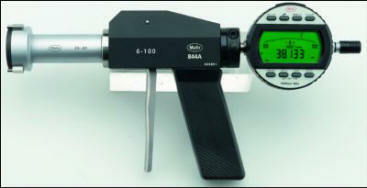 Mahr Bore Gage Ideal for rapid checking of diameters, roundness and conicity. INTERNAL measurements of: through holes and blind hole. Pistol grip consists of basic instrument 844 Ag and meas. head 44 Ak.Meas. Pistol permits fast connection of the total measuring range, therefore ideal for high speed measuring. Threaded connection for interchanging the measuring heads. Self-centering measuring head with 3 anvils on the side, placed at 120 degree intervals from 12.5 mm anvils for measuring to the bottom of a bore. As of 40mm, aluminum measuring head to minimize weight.